One of the things we like to do when we escape the winter up north and come south to Key Largo is to kayak. Last year was the first year we attempted the feat and let me tell you, the first try at getting in was not pretty. We were so glad there was no one around to see us. We both ended up in the water. But since then, we've learned balance and poise--well balance anyway. This year it was a little too chilly to get out on the water the first week we were here. We made it out several times the second week and started checking out all the spots we'd paddled to last year. 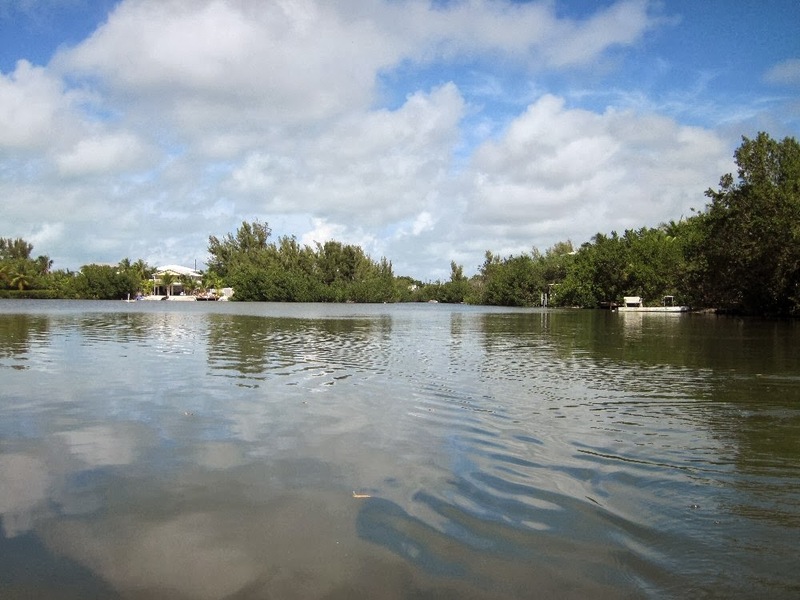 North of our complex is an arm of land that extends into Key Largo Bay or Bayside or Florida Bay. We've heard lots of different names for it. Just a little ways out there is a canal that runs along the arm and is a nice quiet place to paddle around in. The mouth of the canal is also the place where the local manatees are often spotted munching on the turtle grass below. Our first foray out, we headed for the canal and as we paddled through the entrance, we watched for the large lizard we'd spotted last year sunning on one of the rocks. No lizard. No manatee. But we enjoyed paddling up and around--until we spotted the alligator. On a large flat rock or piece of cement near the water's edge sat an alligator in the sun. He really didn't look to be laying on the rock like most we've seen when they sunbathe. He was a bit on his haunches and had his mouth wide open. He never flinched so we paddled a bit closer. He was as still as a statue. So much so that we laughed thinking perhaps the home owners had placed it there to ward trespassers. We paddled home and thought little more of it until our second trip into the canal. This time we were armed with a waterproof camera to catch the statue of the alligator. Both of us just gaped at the spot where we'd seen it. There was no statue and surveying the spot where it had sat, we could see no way for anyone to get to the spot to place one there. I laughed nervously and said, "Well, maybe they only put it out when they are home so no one will steal it." "Sure, honey," came the response. Not a good picture but the iguana is in the circle I drew. "Well at least we're in a kayak and not on a paddle board like those people." Ahead of us were a group of paddle boarders who had turned around and were headed out again. We never got close enough to warn them. But warn them of what? A real alligator or a statue that disappears? On our way out through what now seemed to be a very narrow entrance to the canal, I heard a rustling in the mangroves that line the channel. From the sound of it, I knew it was bigger than the little annoying lizards that scurry around down here. 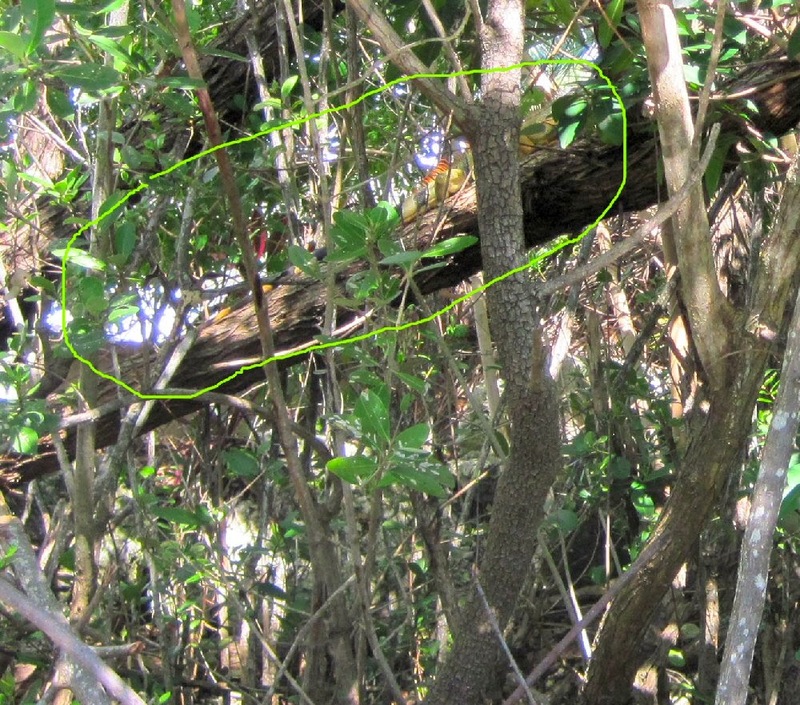 I looked up just in time to see a three foot iguana jump up into a tree. I don't want to think about what he may have been trying to get away from.